We're now being called the "Simon Says Stamp Monday Challenge Blog" - and while it is a new name and home you'll still find us creating vintage inspired goodness each week, sharing our tutorials with you, spotlighting your entries, and basically all the same stuff you've come to know and love here at Stamp and Show. 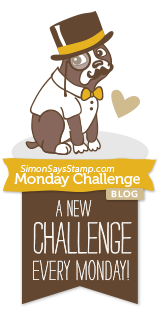 Also new - we've got not just a brand new name, but a brand new vintage Simon badge that you can use on your blogs! Join us, and our three newest designers on Monday for a challenge to really celebrate our new home. 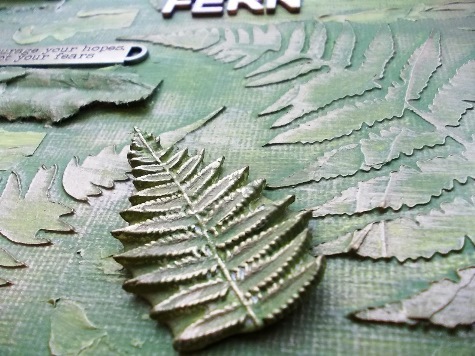 Hi all, Tracy here with a few tips for creating your own mixed media canvas piece. My canvas board for the Simon Says Stamp and Show green challenge incorporates a mix of elements from torn paper, paper clay, recycled corrugated card and lots of texture. I would like to take this opportunity to share a few tips with you all for creating my mixed media piece. Add dimensional pieces, embellishments, torn pages or embellishments prior to painting if you would like the pieces to blend into the canvas. Obviously you can add embellishments at the end as a contrast to the painted elements too. There are no rules! One thing that always helps me with composition is to lay the pieces out prior to painting, playing around with arrangement and taking a picture each time and then looking back on each one and then decide on which I prefer best. If you can not decide on an arrangement, place pieces on the canvas, walk away and then come back a few hours later and then make any decisions. When adding texture with embossing paste I like to apply an uneven coat rather than smoothing the embossing paste as this adds so much more texture to a piece. If you want to apply texture in a different colour you can add acrylic paint to the embossing paste, mix together and then apply. Just ensure that whatever you are mixing with the paste is not too fluid as this will affect the consistency of the paste. 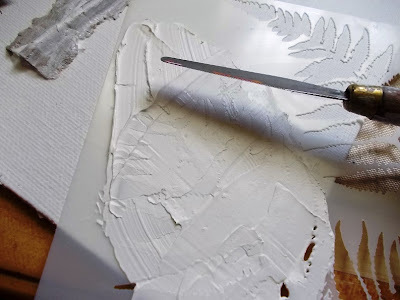 When applying embossing paste through a stencil it can be helpful to tape the stencil to the canvas to ensure no embossing paste seeps under the stencil. Highlighting texture really lifts the canvas, using white or gold or a contrasting colour works beautifully. On my canvas I dry brushed with a gold paint to highlight all the raised areas. To dry brush, simply use a tiny amount of paint and lightly paint over the raised areas. It is important to remove any excess paint from the brush, your brush should be virtually dry when dry brushing. To blend the corrugated card into the background I always find a good tip is to add texture paste around the edges of the raised areas and then paint over. If you add charcoal around stamped images or around a focal image this really lifts the focal point from the backdrop. Using a white pen to highlight areas also adds dramatic results. 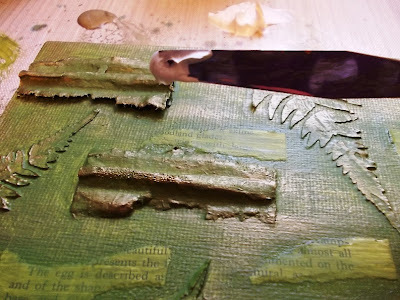 If you want to add texture to your canvas without using Embossing Paste try crumpled tissue paper adhered with PVA glue and then painted over with paint, looks fantastic. Always remember if you are not happy with the finished result, you can always paint over it again with Gesso and begin again. If you use a canvas board rather than a traditional canvas, stamping directly onto the canvas board is much simplified and you will achieve a crisp clear image. Otherwise stamping onto tissue and then applying to a canvas is also another option. Thanks for joining me today! 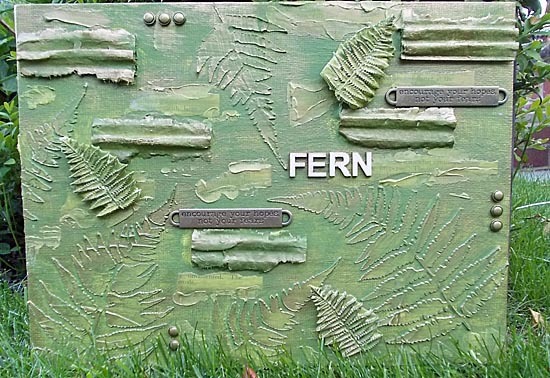 If you'd like to see the detailed step-by-step instructions for my ferns canvas board you can find them today over on my blog. Thanks to Tracy for these great tips & tricks! Now are you feeling inspired to get green? Join us in this week's challenge! 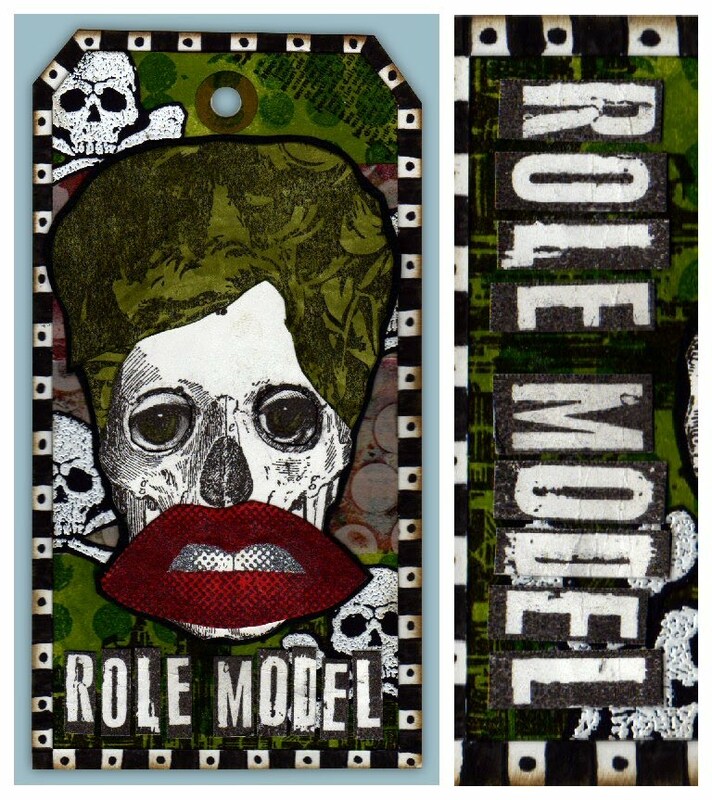 Click here to see the rest of the design team's entries and to enter your creation. For the full rules, read the "challenge rules" posted in the side-bar here on our blog. Hello everyone! Candy Colwell here and I am so excited to be sharing this step by step tutorial on how to create this very sweet vintage 8x8 canvas. Our theme this week is "Good To Be Green". So many things inspired this piece. When I think of summer, I think of the lush greenery, people with "green thumbs" and the beautiful, fragrant flowers that grace us with their presence in the summertime. So, from that, "Bloom Where You Are Planted" was born. I hope that this dimensional celebration of summer inspires you to be creative, have fun with your art and not be afraid to try something new! Step 1: Begin with a plain 8x8 stretch canvas. size it to approximately 3"x 5". I found this sweet image on the internet a long time ago and the photo was naturally tinted green - which is perfect for this canvas! Note: I left about a 1/4" border all the way around to more resemble an old photograph, but that is optional. Step 3: Brush Matte Multi Medium onto the canvas in the area that you will be attaching the photograph. Then place the photograph and brush over it with Matte Multi Medium to seal it. Matte Medium dries clear and doesn't have a lot of dimension, which makes it a great glue and sealer. Step 4: Add Bundled Sage Distress Paint all over the canvas, including the sides and allow to dry. On a non-stick craft sheet add a spritz of water and some Peeled Paint Distress Paint. Lightly brush this onto the canvas using a paint brush to achieve that streaked effect and let it dry. Step 5: Mix a few drops of Fired Brick Reinker into White Embossing Paste. Mix the color until you achieve the brick color you want, and then lay the brick wall stencil randomly over the canvas and scrape the embossing paste onto the canvas. Be sure to allow it to dry or use a heat tool before adding more bricks. Repeat this process until you are happy with the placement of your bricks. Tip: After applying a couple of bricked areas, clean the stencil before applying more to be sure you are not transferring excess paste onto your canvas. Step 6: To dull the red bricks a little and add a bit more of a shabby chic feeling, use a brush to apply some Picket Fence Distress Paint that had been diluted with a little water over the bricks and around the edges of the photograph. 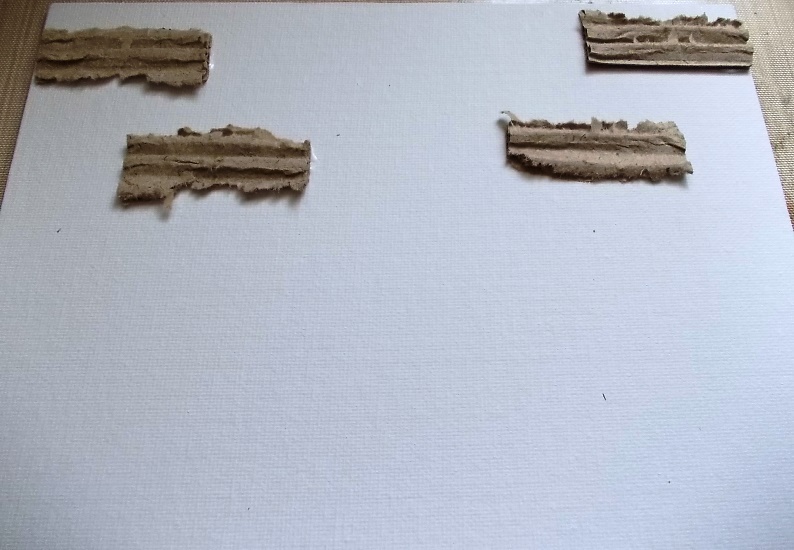 Once dry, add some Gathered Twigs Distress Ink to the edges and randomly on the canvas with an Ink Applicator. Now that our background is done, let's move on to the embellishments! Step 7: Paint chipboard letters "BLOOM" with Pitch Paint Dabber and let dry. Then ink the letters with Vesamark (or any clear embossing ink) and cover with clear UTEE (ultra thick embossing enamel). Place the letters on your craft sheet and return the left over UTEE to the container. Heat the letters until the Clear UTEE is melted, leaving a shiny dimensional letter. Step 8: Create an 8" picket fence out of a 6" Tim Holtz On The Edge die cut titled On The Fence. Line up one end of an 8" x 2 1/2" strip out of plain Grungeboard on the edge of the die as you normally would. Leave about 1/2" at the bottom for a good base to the fence. To extend the fence, take the uncut portion of the Grungeboard and line it up next to the last picket in the fence where they would normally join together with the next picket. Lay the Grungeboard between the plastic sandwich pieces and cut it. You will have an extended 8" piece of fence that is barely noticeable where they were joined together. Step 9: Paint the fence with a basecoat of Espresso Adirondak Paint Dabber and let dry. Next add a thin coat of Paper Artsy's Fresco Finish Crackle Glaze. When almost dry, add a light top coat of Fresco Finish Snowflake. Within 20 seconds (no exaggeration), the fence starts to crackle! When dry, distress the fence with Gathered Twigs Distress Ink. Step 10: Lightly dry brush little clay pots with the Snowflake paint. Then add a green wire for a "stem" into some moss or other filler and stuff into your pots. To adhere the pots, use hot glue the pots onto the fence and wire them on using a dark wire. note: I had some tiny clay pots to decorate for this piece, if you don't have any you can always die cut some from paper first. 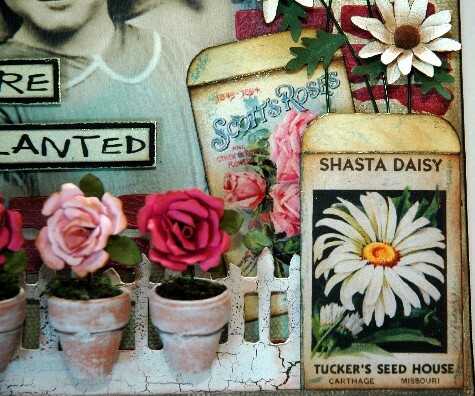 Step 11: Create the little roses and daisies/sunflowers from the Susan's Garden Collection Sizzix dies. For this miniature sunflower, you begin by placing the die cuts (blades up) onto the platform and covering them with cardstock then the plastic cover. Create dimension on the petals, leaves and calyx using Susan's Tool Kit. The kit comes with everything you need to create all of her fabulous flower creations. I also used some brown chalk to color each petal at the base. Glue the first row of petals onto each of the projections from the calyx. Then repeat for the second row of petals, stacking them in between each of the petals on the first row. Glue the leaves to the underside and all that is left is adding the center. On the canvas, I cut a small white pom poms in half, sprayed them with Vintage Photo Distress Stain and glued them to the centers. For a different look on this sunflower, I added a little glue to the center of sunflower and added small brown seed beads. Be creative with your centers! Note: here is also a wonderful set of videos and PDFs on Sizzix' website to help you when creating all of the Susan's Garden flowers. I found it helpful to have Susan's set of tools when creating these precious little flowers. When you finish creating the roses, daisies and sunflowers, set the daisies and sunflowers to the side to put in place later. Hot glue the roses to the green wires coming out of the pots. leaving enough space between them so you can create an envelope. Note: you could also purchase little pre-made seed packets like these from Webster's Pages or these from Jenni Bowlin. In this case, the image of the seed packet was 1 1/2" across. Make sure that the sides, when folded behind would overlap just enough to be glued together with 1/4" Scor Tape. The top and bottom flaps are 1/2". Fold the sides inward, using a Bone Folder for a better crease and trim the edges slightly inward. Apply the 1/4" Scor Tape to the overlapping side of the seed packet and across the bottom tab. Seal the pieces together, creating the little seed packet. Use a CropADile Radius Chomper (in this case, I used the 1/8" side) to create the rounded edges on the top flap. Distress the inside and outside of the flap with Gathered Twigs Distress Ink. A perfect little replica of an antique seed packet! Step 13: Print words onto cardstock in the font of your choice, or use small letter or word stamps or stickers to create additional words for your canvas. Mount the words onto black cardstock so that a thin border shows, then rub the edges lightly with gilding wax. Note: My letters were approximately 3/8" high and anywhere between 1 1/4" (you and are), 1 1/3" (where) and 2" (planted) long. Place your letters (bloom) onto the canvas using Glossy Accents. Add pop dots to the back of the words that you printed out, but don't adhere them until you've added the flowers. Use pop dots on the fence before adhering. Use hot glue when attaching the seed packets in place on top of the fence. Stick random length green wire "stems" inside of the seed packets and hot glue the ends of them in place on the canvas where you want a flower to be. Finally, to finish off the outer edge of the canvas, I ran a 1/2" inch piece of black ribbon around the perimeter of the canvas and attached it using 1/2" Scor Tape all the way around. I hope that my "Bloom Where You Are Planted" canvas has inspired you to let your crafting bloom this week and enter our challenge. Thanks to Candy for this amazing tutorial! Now are you feeling inspired to make something with a bit of green yourself? Then join us in this week's challenge! Click here to see the rest of the design team's entries and to enter your creation. For the full rules, read the "challenge rules" posted in the side-bar here on our blog. From upcycling to playing with your favorite green ink pad, this week we’re all about how good it is to be green. Whether you want to use something that would otherwise be garbage on a project and be inspired to be environmentally friendly, or if you want to play with the color we hope you’ll join us. I love combining mint green with navy blue, I also (of course) adore my Mowed Lawn distress products. What to choose? From frogs to leaves, olive to kelly - we look forward to seeing all things green this week. Kicking things off for us this week we have a special guest- Cheiron! 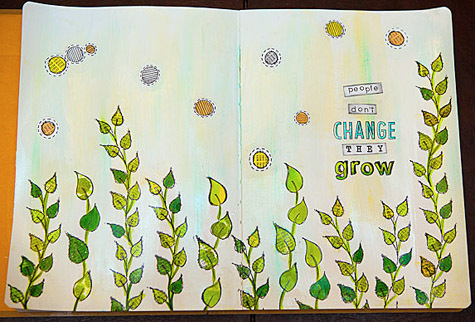 She is a designer for Simon's Wednesday challenge blog, and she creates some beautiful projects. Cheiron works in the financial district by day, and spends her nights relaxing at the craft table. She has been making cards since 2004, and has recently been exploring the world of mixed media. I love playing around with mixed media techniques and incorporating them into my card making, but this time I have created pages in an actual art journal. For this green challenge it was all about leaves for me. I used the Dyan Reavely Around the Edge stamp set which has great leaves and fun dots that I colored in with Faber Castell Pitt Artist Pens and paper pieced some of the leaves with stenciled papers from my stash. The background of the page is subtle, made by applying some glazing medium mixed with a bit of paint first in blue, and once dried with yellow. 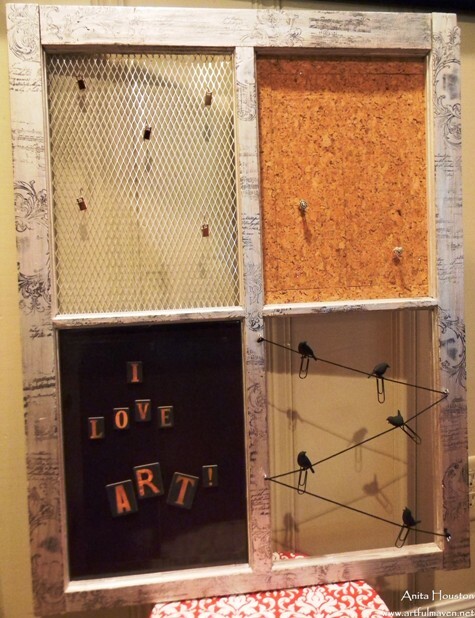 Rather than using the green color, Anita went green by upcycling an old window pane into a new organizational board for her last project her at Simon Says Stamp & Show. Yes stampers, sadly this is my last project at SSSS&S. I have thoroughly enjoyed my time here, and I thank the crew and DT for a most wonderful experience! I am going to miss it. I had a large (24x33) old window pane leaning against the wall in my garage for some time now, so with a little elbow grease, some reinforcing, and Ranger's Pearl Acrylic Paint Dabber it gleamed like new. After stamping on it, I filled the panes with Cork Sheet, Magnetic Paneling, wire mesh, and string to hang and attach tags and things I want to display in my work area. I will later add a shelf to the bottom of it when I have more time, but I am happy with how it came upcycled out! Ashli's project started out as just some simple creative play. One thing lead to another and she ended up with a fun little décor piece! When I started this, I had no idea where it would end up. Sometimes that is the best way to create! I began by simply playing with a favorite stencil from The Crafter's Workshop and some Green mists on a few oversized tags. When I had three finished tags, I loved them so much that I decided to turn them into an art piece! And since we are all about green this week, I up-cycled a scrap piece of white paper and leftover piece of plywood. With all my tags mounted, I headed to my embellishment drawer. Once I found that adorable house from the American Crafts Mayberry line, I knew the direction to take this tag art in! Home Sweet Home - complete with the date we purchased our house. I love it when a little session of creative play leads to an unexpected and fun finished art piece! This week I (May) went leaf-y with the challenge. Like Cheiron, I heard green challenge and grabbed for my beloved Dylusions leaf stamps! I had a lot of creative fun making this tag and layering both stamps and colors as I created so much leafy (green) goodness. Combined with my favorite Dylusions flower stamp, as well as some summer distress to make my background I've now got a tag ready to place on a birthday package for someone special. Meihsia chose yellowish-green to interpret her outdoor themed layout this week. My daughter Natalie loves outdoor activities a lot so on this layout I used a photo of her and two of her favorite colors - blue and green. The background of this layout was colored using Ranger Adirondack Paint Dabber LETTUCE and stamped with Clearsnap ColorBox pigment ink and Versafine Onyx Black. I made a zipper flower and had some machine sewing stitches to decorate this page. The beautiful green on this layout reminds us of the great time we had in Austin. Suzz decided to up-cycle a vase and use some of her leftover bits and pieces to keep it green. I had this lovely glass vase that I have been wanting to up-cycle. I was thinking green and pulled out out my jar of buttons,leftover lace, and doilies to cover my shabby chic vase. I painted the entire surface using white acrylic paint. To add color I sprayed the surface with Tattered Angels Glimmer Mist Be Mine and Sun Sisters. I layered a mix of embellishments all painted white to coordinate. I included Tim Holtz Idea-ology Timepieces, 7 Gypsies 3 Key Charm Embellishments, Bo Bunny Medium Doily, and a little trimming. Sandra Mouwen made a green birthday tag with die cuts made out of cereal boxes. I love to use old cereal or other food boxes for die cutting. It is really good cardboard, it's free and it's green because I recycle it. I have a big pile of ready to go recycled cardboard. For this tag I did, what I call the Metallic Marbled Stain technique, and used Evergreen Bough, Shabby Shutters and Brushed Pewter Distress Stain. In the background I stamped with my go to stamp Script from KaiserCraft and the number 3 with the Numero stamp set from 7Gypies. When thinking about what to do this week, my eyes fell on Tim Holtz new Ruler Binder and I decided to make a tag book about my school years. I used almost only shades of green, with a little bit of kraft and gold. The tags were coloured with Distress Paint, inked and stamped, mainly with Stamper's Anonymous stamps and with four green Archival Inks. 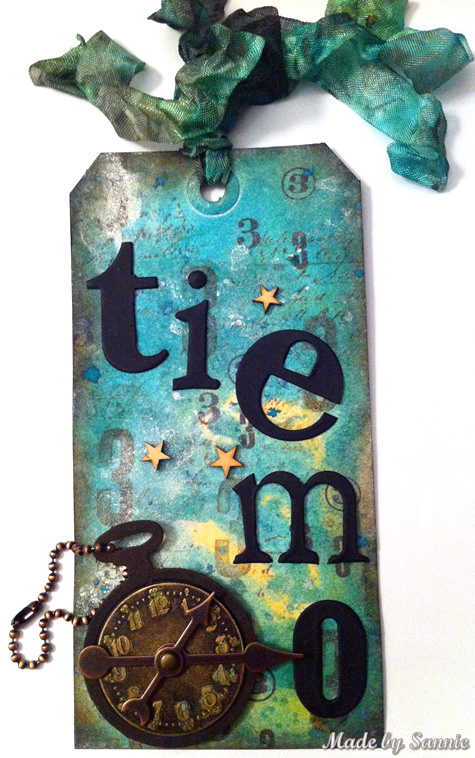 Tim Holtz rub-ons are perfect for small spaces and pages and I used them here and there. For a recycled detail, I die cut letters and numbers from clear packaging and coloured with alcohol inks. This week Dan was inspired by an article he'd read about the pressures on girls to conform to images in fashion magazines. I know, I know. It's a bit out there. I know exactly what you're thinking, but I pushed this one right out there because I was inspired by a serious topic and didn't want to pull my punches. This started out as a manilla tag, not that there's much evidence left of it. I cut the eye sockets out of the skull and replaced them with eyes from the Classics #5 stamp set and the mouth is Wendy Vecchi's Kiss Me stamp. Do you recognise the hair? It's repurposed from the David stamp in the Artful Artifacts set. I had a lot of fun trying the packing tape technique with the GelliArts printing plate and have included a panel of that here too. Oh yeah, one last thing...green. I used lots of green! If that isn't enough inspiration for you - we also have TWO fabulous posts coming later this week! Candy loves the lush greenery and beautiful fragrant flowers of summertime. I hope you will check back on Tuesday for a step by step tutorial on this "Good To Be Green" very vintage, very dimensional home décor piece that I created with you in mind. Tracy used a mix of recycled elements, paints and foliage in her canvas board. Pop back here on Thursday when I will have a few tips and ideas for creating my canvas and adding wonderful texture to your pieces. There will also be full step by steps for creating my canvas board on my blog. As always, Simon Says Stamp is giving away a $50 gift voucher that will go to a random entry chosen by Random Generator. To qualify all you need to do is create a new project that ties in (in any way!) with our theme and post it, along with a link back to this challenge, and add a link here. This challenge will end at 11:59pm on Sunday July 21 Eastern time. We will also be choosing some of our entries to put in the spotlight - a special honor where we talk about why we loved that entry in particular and award a special badge too! It's that time of the week - time to announce last week's spotlight winners as well as the winner of the $50 voucher to the shop! A week like this, with 397 absolutely stunning, amazing, wildly creative entries well I'm REALLY glad we don't have to pick just three! Narrowing it down was a tough job - but we have seven entries to spotlight today - and lots of tutorials you'll want to check out! Want to see "chunky ATC" taken to a whole new level? #116 Elly absolutely amazed me with her creation - and she shares great photos of the process so you can see exactly how she made this. Tracy said: This piece really caught my eye, the texture, embellishments and the wonderful bright cheery colours, really lifts the spirit. 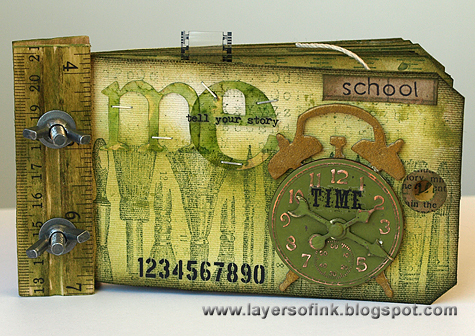 Such a wonderful transformation from a block of wood to create a fabulous chunky ATC. #139 Vivian Keh shares an artfully splattered layout this week. Dan said: the splattered misted background with subtle elements of stamping integrated into it is very well done and her flowers tie in to it so beautifully colour wise but look great in their own right, I love the tissue-y petals. 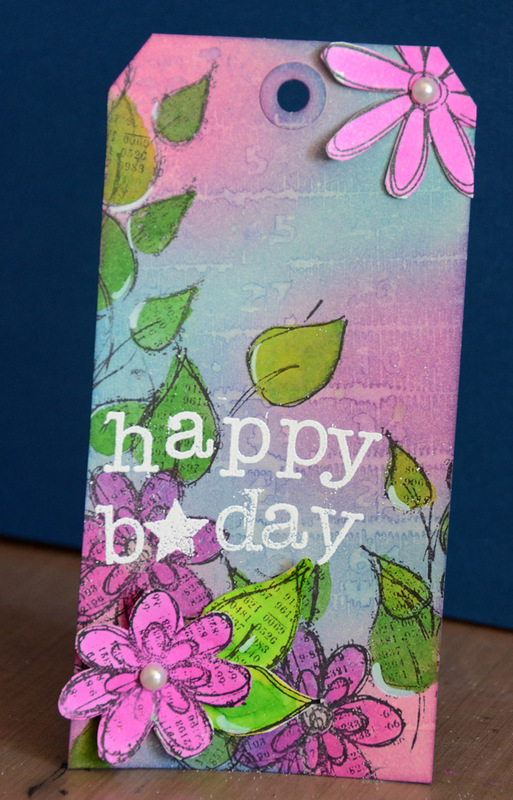 #148 Izzwizz has shared a fantastic tutorial and card this week. Anita says: Her tutorial for the flower box is fabulous, and very easy to follow! It's an amazing creation that would transform any paper crafting project to the WOW factor! We love seeing Tim's clocks turned into works of art - and #149 Annette Green has a tutorial to go with hers! Anna-Karin says: Absolutely gorgeous clock by Annette, altered with Vintaj patinas. How clever to use the Picture Wheel as a backdrop for her watch face. Love all the gears and numbers too. Sandra says: love the patina look she achived with the vintaj and what a clever clock face! #160 Die Amalie created such texture, so much beautiful blended color and feeling to her piece I wish I could actually see it in person. I loved seeing the creative process behind the piece, and it makes me want to do some mixed media canvas work for my home soon! When it comes to fun, #166 Maura sure knows how to make the most of her craft time! Candy says: Maura has created such fun and creative traveling themed cards. Her use of color and texture on the backgrounds really sets the tone for all of her detailed stamping and embellishing she’s done on each card. What a cool way to repurpose old playing cards! Last but not least, #359 Donna Mack has a fabulous card. Dan says: I love how she's pulled off a very clever trick with this card - it's beautifully distressed yet somehow manages to maintain a crisp and clean feel, not easy to do! Congrats to all of our entries featured in this week's spotlight! If you'd like to display our special spotlight badge on your blog email May and she will give you the code. But wait, we haven't forgotten the big prize of the week! 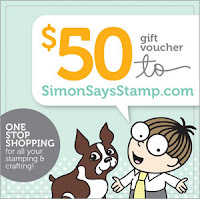 I'd like to thank Simon Says Stamp for another great chance to win a $50 voucher!! Please claim your prize within the next two weeks by emailing May. I'd like to thank everyone who took part in the challenge as it is always a joy to see what you create. I'd also like to say thank you again to Simon Says Stamp for their generosity - each week we give away a $50 gift voucher to the shop that you can use to buy all kinds of fabulous stamps, inks, and paper crafting supplies. Remember - you just need to enter the challenge each week to be entered into the drawing!